From my last post on PIM BiDir I got some great comments from my friend Peter Palúch. I still had some concepts that weren’t totally clear to me and I don’t like to leave unfinished business. There is also a lack of resources properly explaining the behavior of PIM BiDir. For that reason I would like to clarify some concepts and write some more about the potential gains of PIM BiDir is. First we must be clear on the terminology used in PIM BiDir. Rendezvous Point Address (RPA) – The RPA is an address that is used as the root of the distribution tree for a range of multicast groups. This address must be routable in the PIM domain but does not have to reside on a physical interface or device. Rendezvous Point Link (RPL) – It is the physical link to which the RPA belongs. The RPL is the only link where DF election does not take place. The RFC also says “In BIDIR-PIM, all multicast traffic to groups mapping to a specific RPA is forwarded on the RPL of that RPA.” In some scenarios where the RPA is virtual, there may not be an RPL though. 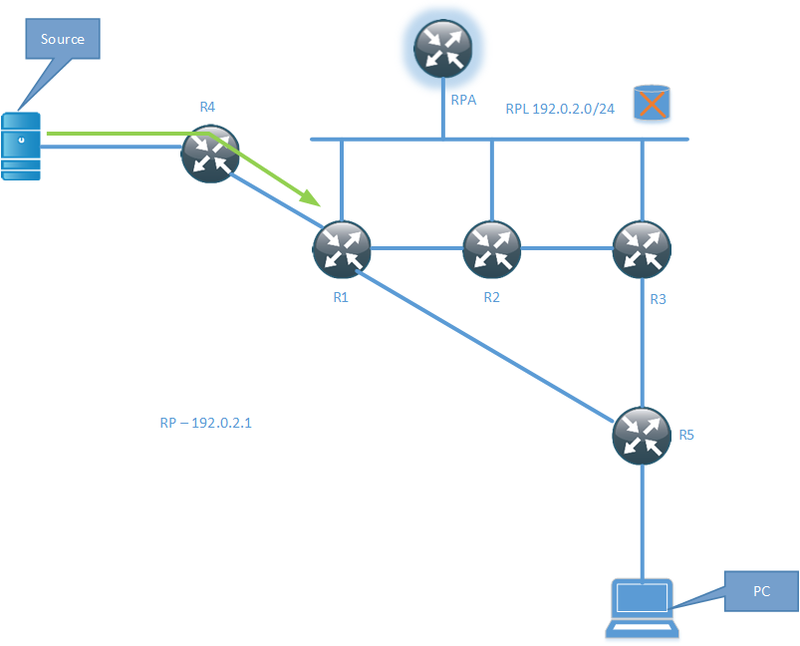 Upstream – Traffic towards the root (RPA) of the tree. This is the direction used by packets traveling from source(s) to the RPL. Downstream – Traffic going away from the root. The direction from which packets travel from the RPL to the receivers. Designated Forwarder (DF) – A single DF exists for every RPA on a link, point to point or multipoint. The only exception as noted above is the RPL. The DF is the router with the best metric to the RPA. The DF is responsible for forwarding downstream traffic onto its link and forwarding upstream traffic from its link towards the RPL. The DF on a link is also responsible for processing Join messages from downstream routers on the link and ensuring packets are forwarded to local receivers as discovered by IGMP or MLD. RPF Interface – The RPF interface is determined by looking up the RPA in the Multicast Routing Information Table (MRIB). The RPF information then determines which interface of the router that would be used to send packets towards the RPL of the group. RPF Neighbor – The next node on the shortest path towards the RPA. One of the confusing parts in PIM BiDir is how traffic travels from the source(s) to the RPA. There is no (S,G) and no PIM Register messages in PIM BiDir, so how is this handled? When a source starts sending traffic it will send it towards the RPA regardless if there are any receivers or not. The DF on the segment is responsible for sending the traffic upstream towards the RPA. The packet then travels through the PIM domain until it reaches the root of the tree (RPA). In some articles on PIM BiDir, it is mentioned that there is no RPF check. This is not entirely true since RPF is used to find the right interface towards the RPA but it does not use RPF to ensure loop free forwarding, the DF mechanism is instead used for this. 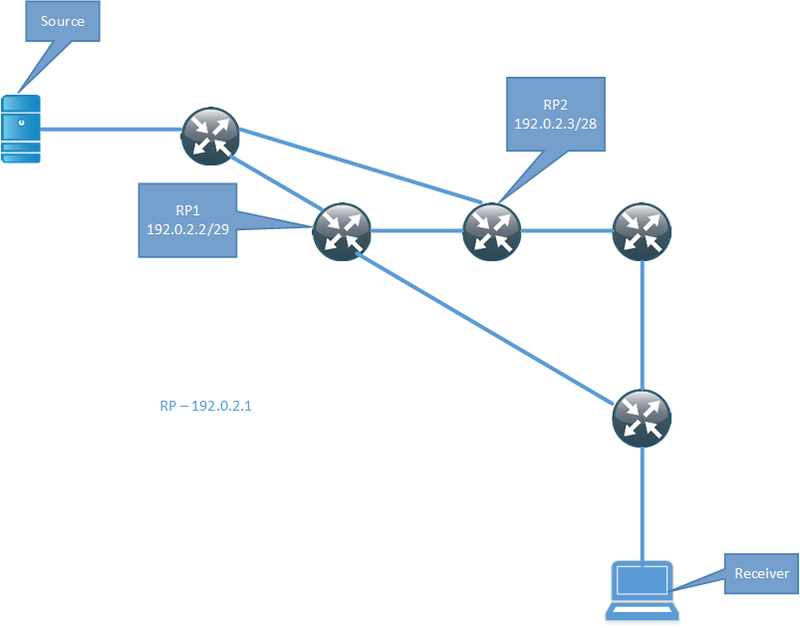 The picture shows a source sending traffic to a multicast group, there are no interested receivers yet. Traffic from the source travels towards the RPA which is not a physical device but only exists virtually on a shared segment with the routers R1, R2 and R3. These routers are connected to the RPL and on the RPL, there is no DF election. This means that they are free to forward the packets, however, there are no receivers yet and hence no interfaces in the Outgoing Interface List (OIL). This means that traffic will simply get dropped in the bitbucket. This is a waste of bandwidth until at least one receiver joins the shared tree. Since there is no way to control what the multicast sources are sending, what we are giving up for getting minimal state in the PIM domain is bandwidth. It is not very likely though that a many-to-many multicast application will not have any receivers so this may be an acceptable sacrifice. Due to having minimum state, PIM BiDir will use less memory compared to PIM ASM or PIM SSM, it will also use less CPU since there is less PIM messages to be generated and received and processed. Is this a consideration on modern platforms? It might be, it might not be. What is known though is that it is a less complex protocol than PIM ASM because it does not have a PIM Register process. Due to this, the RP, which does not even have to be a real router, can’t get overwhelmed by the unicast PIM Register messages. This also provides for an easier mechanism to provide RP redundancy compared to PIM ASM and SSM which requires anycast and MSDP to provide the same. While writing this post I needed to run some tests, so I booted up VIRL and tested on IOSv but could not get PIM BiDir to work properly. I then tested with CSR1000v, both within VIRL and directly on an ESXi server with the same results. These images were quite new and it seems something is not working properly in them. When the routers were running in BiDir mode, they would not process the multicast and forward it on. Just a fair warning that if you try it that you may run into similar results, please share if you discover something interesting. To get an understanding for the whole process, let us then describe all of the steps from when the source starts sending until the receiver starts receiving the traffic from the source. The source starts sending traffic on the local segment to R4. R4 is the DF on the link since it’s the only router present. R4 does a RPF check for 192.0.2.1 which is the RPA, through this process it finds the upstream interface and starts forwarding traffic towards the RPA where R1 is the RPF neighbor and the next router on the path towards the RPA. R1 forwards traffic towards the RPA on its upstream interface but there are no interested receivers yet, so the traffic will get dropped in the bitbucket. Please note that both R2 and R3 does receive this traffic but if there is no interface in the OIL, the traffic simply gets dropped. The PC then starts to generate an IGMP Report and sends it towards R5. R5 is the DF on the segment which also means that it is the Designated Router (DR). It will generate a PIM Join (*,G) and send it towards the RPA on its upstream interface where R3 is the RPF neighbor. Only the DF and hence DR on a link may act on the IGMP Report. R3 receives the PIM Join from R5 and since traffic is already being sent out by R1 on the RPL, R3 is allowed to start forwarding the traffic. Remember that there is no DF elected on the RPL. We now have end to end multicast flowing. The main goal of this post was to show how the RP can be a virtual device on a shared segment. This means that redundancy can be designed into the RP role without any complex mechanisms used in PIM ASM. I also wanted to clarify some concepts with the forwarding and the terminology since there seem to be quite a few posts out there that are slightly wrong or not using the correct terminology. This post will describe PIM Bidir, why it is needed and the design considerations for using PIM BiDir. This post is focused on technology overview and design and will not contain any actual configurations. Multicast is a technology that is mainly used for one-to-many and many-to-many applications. 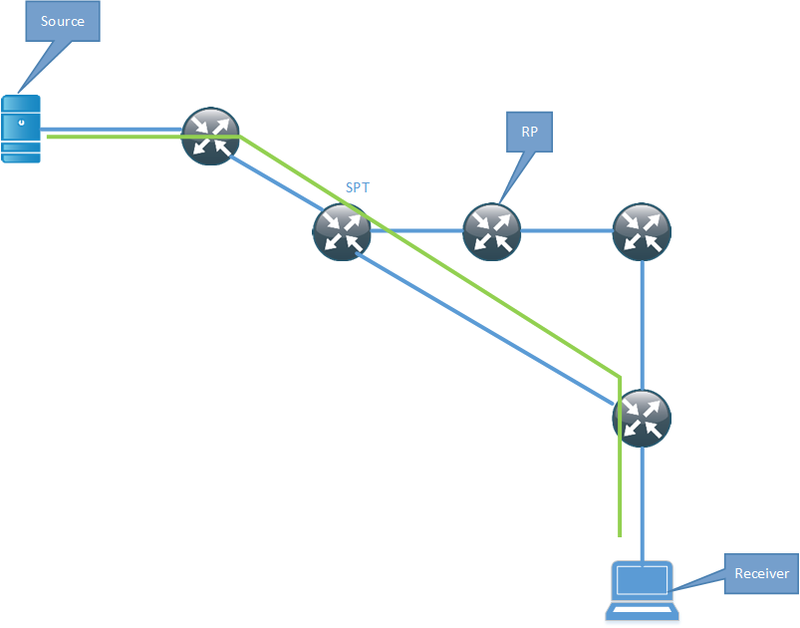 The following are examples of applications that use or can benefit from using multicast. One-to-many applications have a single sender and multiple receivers. These are examples of applications in the one-to-many model. Many-to-many applications have many senders and many receivers. One-to-many applications are unidirectional and many-to-many applications are bidirectional. Multi-player games: Many multi-player games are distributed simulations and also have chat group capabilities. PIM has different implimentations to be able to handle the above applications. There are mainly three implementatios of PIM, PIM Any Source Multicast (ASM), PIM Source Specific Multicast (SSM) and PIM BiDirectional (BiDir). Initially traffic flows through the RP, there is a more efficient path though. When the Last Hop Router (LHR) starts receiving the multicast it will switch over to the SPT.The SPT will be a more optimal path and (likely) introduce lower delay between the source and the receiver. PIM SSM was created to work better with one-to-many flows compared to PIM ASM. In PIM SSM, there is no complex handling of state and there is only SPT, no RPT. That also means that there is no need for a RP. PIM SSM is much easier to setup and use, it does require clients to support IGMPv3 so that the IGMP Report can contain which source the receiver wants to receive the traffic from. This also means that since there is no RP, there has to be some way for the receiver to know which sources send to which groups. This has to be hanled by some form of Out Of Band(OOB) mechanism. The most common use for SSM is IP-TV where the Set Top Box (STB) receives a list of sources and groups by contacting a server. The drawback of PIM SSM is that (S,G) state is created requiring more memory. Depending on the number of sources, this may be a factor or not. Bidirectional PIM was created to work better with many-to-many applications. PIM BiDir uses only RPT and no SPT. This means that there has to be a RP. With bidirectional PIM, the RP does not perform any of the functions of PIM ASM though, such as sending Register Stop messages or joining the SPT. Remember, in PIM BiDir, there is no SPT.The RP in PIM BiDir does not have to be a physical device since the RP is not performing any control plane functions. It is simply a way of forwarding traffic the right way, think of it as a vector. The RP can be a physical device and in that case it is a normal RP, just without the responsibilities of an RP as we know it in PIM ASM. When configuring PIM BiDir to have redundant RPs the RP is sometimes called Phantom RP, because it does not have to reside on a physical device. PIM BiDir is often used in “hoot n holler” and financial applications. PIM BiDir and PIM SSM are at different ends of the spectrum where PIM ASM can serve both type of applications. PIM uses the concept of Reverse Path Forwarding (RPF) to ensure loop free forwarding. RPF ensures that traffic comes in on the interface that would be used to send traffic out towards the source. PIM BiDir can send traffic both up and down the RPT. This is not normally supported by using RPF, to support this PIM BiDir uses a Designated Forwarder (DF) on each segment, even point-to-point segments. The main responsibility of the DF is to forward traffic upstream towards the RP. The DF is elected based on the metric towards the RP, essentially building a tree along the best path without having to install any (S,G) state. RPF is still used to find the appropiate path towards the Rendezvous Point Link (RPL) but it is the DF mechanism that ensures loop free forwarding. In PIM BiDir there isno MSDP, it does not use (S,G) so this is expected. To provide redundant RP in PIM BiDir, Phantom RP is used. The Phantom RP is a virtual RP which is not assigned to a physical device, it is often implemented by having two routers use a loopback with different subnet mask length. Routers are assigned the RP adress of 192.0.2.1 which is then the Phantom RP, the actual routers where the traffic will flow through have been assigned 192.0.2.2 and 192.0.2.3 but with different net mask lengths. Normal best path rules will then forward traffic towards the longest path match which will be RP1 when it is available and RP2 when RP1 is not available. It is important to not configure the RP address as a physical interface address since this would break the redundancy. If a router was configured with the real address, it would not forward the traffic since the traffic would be destined for one of its own addresses. Since the RP is so critical, redundancy must be provided. All traffic will pass through the RP which means that certain links in the network may have to carry a lot of the traffic. For this reason it can be necessary to have several RPs, that are acting as RPs for different multicast groups. The placement of the RP also becomes very important since traffic must flow through the RP. PIM BiDir uses the DF mechanism and for the election to succeed, all the PIM routers on the segment must support PIM BiDir, otherwise the DF election will fail and PIM BiDir will not be supported on the segment. It is possible to have non PIM BiDir routers on a segment if a PIM neighbor filter is implemented to not form PIM adjacencies with certain routers. That way PIM BiDir can be gradually implemented into the network. PIM ASM supports all multicast models but at the cost of complexity. One could say that it’s a jack of all trades but does not excel at anything. PIM SSM is less complex and the best choice for one-to-many applications if the receivers have support for IGMPv3. PIM BiDir is best suited for many-to-many applications and keeps the least state of all the PIM implementations. Every PIM implementation has its use case and as an architect/designer its your job to know all the models and pick the best one based on business requirements.